Welcome to Magical Girls Website ! This website is dedicated to all the magical girls lovers. I always loved the magical girls anime series, that's why I decided to make this website. Also to show you the things I have collected through the years, like books, cd, dvd, etc. Thank you for visiting and have fun surfing around!! If you want to use some of my images & scans on your website please read the disclaimer. My Collection: added 26 new items in Various, 7 models, 2 plush and 1 cd. Creamy Mami: added 1 new gif, 100 cels. Magical Emi: added 13 cels. My Collection: added 1 in Various Items, 1 in Notebooks, 4 dvd & opened a new section for my magazines. My Collection: added 17 items in Various and 2 figures in Models. 15.09.2010 My Collection: added new goods in Various Items and new action figures in Models. Network: we have a new space ! Check it out and join us ! My collection: added new items in Plush dolls and 1 figure in Models. 19.06.2010 Blog updated. Holidays: I'll be on holiday from June 21st to July 8th. 02.06.2010 Blog updated, Multimedia: added 1 new file. 10.05.2010 My Collection: added new goods in Various Items. 03.05.2010 Lalabel: added some cameos, 22 new screenshots and 10 special images. 16.04.2010 International Anime Fair: added 13 new pictures. 06.04.2010 My collection: added 29 various items, 3 new notebooks, 1 manga serie, 1 new book. 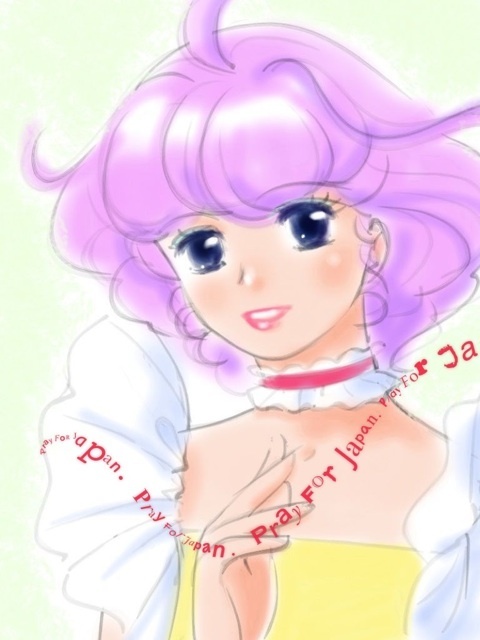 Creamy Mami: added 1 new artworks by Akemi Takada and 8 new gifs. Wallpapers: added a new one. A new section dedicated to the International Anime Fair and a new one for the pictures of your "magical" collection. 04.03.2010 Creamy Mami: added new gifs. 08.02.2010 My Collection: added new goods in Various Items. 01.02.2010 Pelsia: added 21 new fan arts. 04.01.2010 Creamy Mami: added 5 pictures in other images, Magical Emi: 1 picture in other images, Lun Lun: 13 pictures in other images, Pastel Yumi: 1 picture in other images and added 2 items in My collection (Various). Website on-line since 19 September 2007. This website is for entertainment purposes only and is totally safe for children. All characters and images are © & TM their respective owner, creator, producers. All Magical Girls collectibles displayed on this website are not for sale, part of them it's from my personal collection. If you want to use one of my scans on your website, please just ask. Do not link directly to any of the images used on this website. Some images in this page are © ぴえろ Studio Pierrot. Few images of this website are from the web world, if you recognize some as yours, please tell me, so I can give you credit.